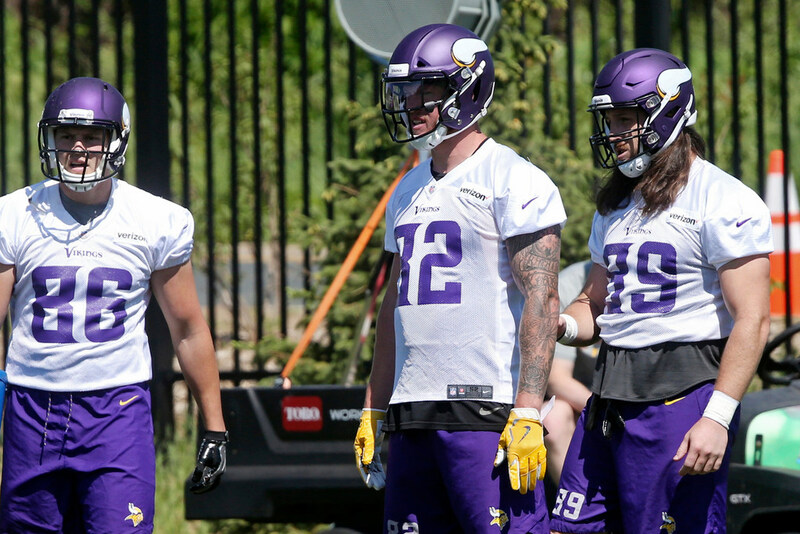 2018 camp preview: How many Vikings tight ends will contribute under DeFilippo? Kyle Rudolph knows new offensive coordinator John DeFilippo's history of using tight ends in his attack, and he's excited to see what he'll bring to the Vikings. The Vikings begin reporting to the first training camp July 24 at the TCO Performance Center in Eagan. The first full-team practice is July 28. Check here for new details on tickets, parking and times. (+) Drafted Tyler Conklin in the fifth round (157th overall) out of Central Michigan. … Re-signed former Michigan State Spartan Josiah Price, who spent last summer in Vikings camp. … Signed one UDFA in Nebraska’s Tyler Hoppes. Rudolph progressed sooner than expected from offseason ankle surgery, taking part on the back end of OTAs and minicamp in June. That’s a good sign after Rudolph was admittedly limited at the end of the season while playing through the severe ankle sprain. The Vikings return every contributor from last season, adding fifth-round pick Tyler Conklin to the room. The move creates competition for the No. 3 spot. David Morgan, a strong blocker, is expected to take a step forward entering Year 3 and could be more involved after catching 10 of 12 targets for 95 yards and a touchdown. How many tight ends will contribute in DeFilippo’s offense? His work in the past, specifically with Gary Barnidge’s Pro Bowl season for Cleveland in 2015, has been lauded. Carson Wentz often targeted his tight ends in Philadelphia with Zach Ertz leading the team in receiving yards in each of his first two seasons. That bodes well for Rudolph a year after he was one of the NFL’s best red-zone threats, catching eight touchdowns and dropping just one ball. Rudolph has strung together 52 straight games played. He’s stayed relatively healthy, albeit while gritting through a bad ankle last season, since missing half seasons in 2013 and 2014. His availability has been one of the lone constants in an unstable period for the Vikings offense. 300 — The number of snaps taken by the Eagles’ No. 3 tight end, Trey Burton, last season with DeFilippo as quarterbacks coach. The Vikings’ third tight end, Bell, saw 145 snaps. The Eagles were rich with talent at the position, so it remains to be seen how DeFilippo can divide snaps among Vikings tight ends this season. No. 3 tight end — The Vikings selected a late-round tight end in each of the last four drafts. Morgan has established himself a capable No. 2 while two other draft picks (MyCole Pruitt, Bucky Hodges) are already on other rosters. Rookie Tyler Conklin should compete with Blake Bell, last year’s third option, for a spot on the Week 1 roster. Diggs and Thielen: Can Vikings keep one of the NFL's top receiving duos?